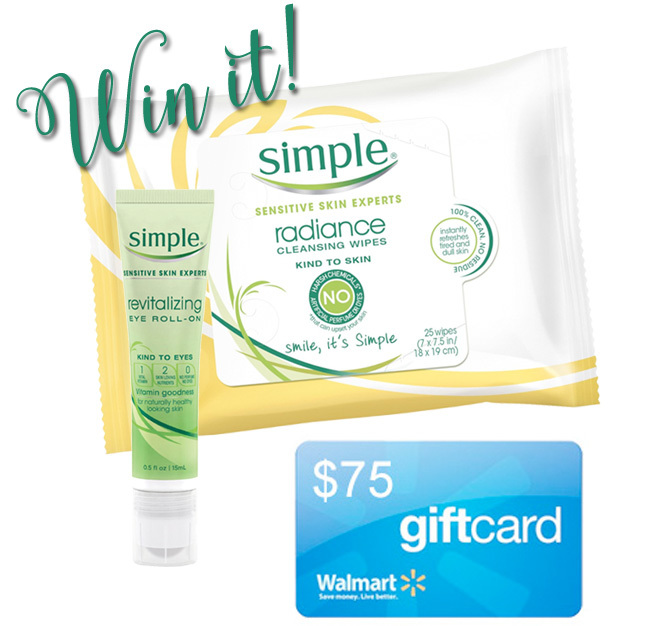 Be Kind to Your Skin with Simple® Facial Wipes + a Giveaway. At the end of the day I am lazy. The last thing I want to do is remove my makeup and go about my facial skin care routine. I do know that it is at this time of day that it is one of the most important things that needs to be done to maintain my skin health. The first step is removing my makeup and the easier the better for me! I'm a no fuss kind of girl, so I remove my makeup with makeup removing facial wipes. One of my favorite brands of makeup removing wipes is Simple® facial wipes. 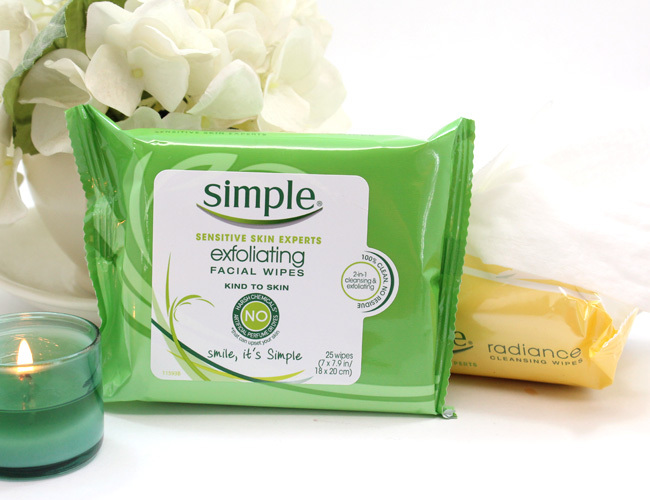 Simple® facial wipes are tough on makeup, but gentle on skin. They refresh and nourish your skin plus remove waterproof mascara in just one step. Simple® facial wipes have no dyes, artificial perfumes or harsh irritants that can upset your skin. And they contain triple purified water to provide instant hydration and reduce the potential for irritation. They’re perfect for when you’re on the go or after the gym when you need a quick cleanse, no rinsing required. I like that there are different types of Simple® facial wipes for different skin needs. Choose from Cleansing Facial Wipes, Exfoliating Facial Wipes, Radiance Cleansing Wipes or Oil Balancing Facial Wipes. I use a mix of both the Exfoliating Facial Wipes and Radiance Cleansing Wipes depending on how I feel my skins needs are. I like using the Exfoliating Wipes to help continually help remove dead skin cells as my makeup is swept away and I like the extra boost of mango extract in the Radiance Cleansing Wipes to leave my face with a naturally healthy glow. Both formulas are safe enough for my sensitive skin. To enter the giveaway, you must leave a comment on this post answering the following question. 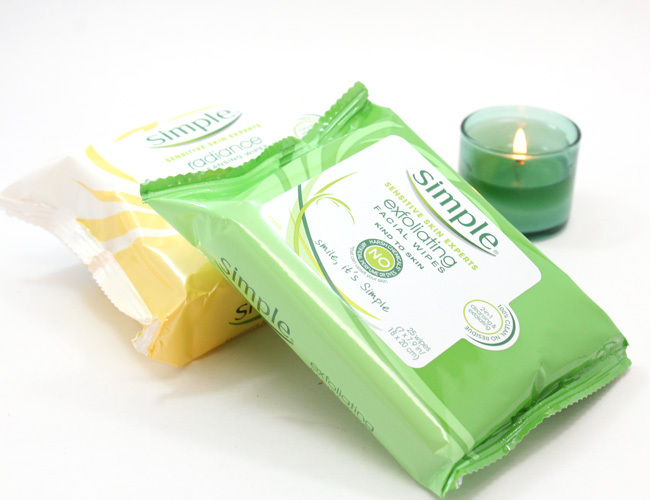 Which Simple® Facial Wipes would you use and why? To be eligible to win, you must answer the question stated above. Hint: Visit the Simple® page for the answer. By entering this giveaway, you agree to the rules listed here. Giveaway ends 4/16/15 at 11:59 PM PST. After 3/22, Walmart will be offering a free 7-pack of Simple® wipes with the purchase of a Simple® cleanser or moisturizer (in-store only). How to Cover Dark Undereye Circles.